At age 10, Lily Hevesh was given her first 28-pack of dominoes from her grandparents. Now, 7 years later, the teenager has grown her collection from 28 to more than 60,000. Not only does she enjoy setting up and knocking down dominoes as a hobby, but it has become her full-time job. “I like to watch them fall,” Hevesh told CBS News. And she’s not alone. She started posting videos of her colorful projects on YouTube and now has more than 865,000 subscribers. Her videos garner millions of views. 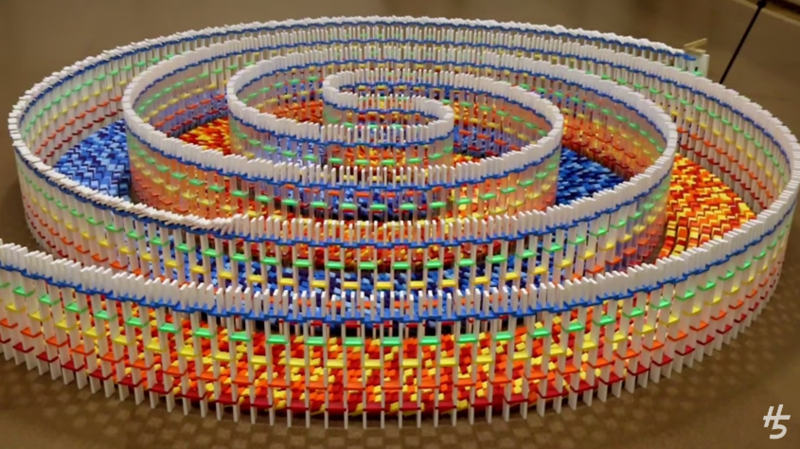 It took 15,000 dominoes and 25 hours of concentration to make her vision come to life. Hevesh said she completed a similar – much smaller – design in 2011. It took time to plan one that was even bigger and brighter than the first. But with millions of views and thousands of comments online, Hevesh is confident her time was well spent. Every Saturday, the YouTube star posts news videos of her designs. She shares personal projects and other pieces she’s designed for museums, ad agencies and companies. Though she knows this won’t be a profession for many, she encourages others to try their hand at dominoes. When one row falls, pick it back up.